8mm Forum: Midget Movie a camjector? » 8mm Forum » 9.5mm Forum » Midget Movie a camjector? Author Topic: Midget Movie a camjector? I'm new on this forum, thanks for accepting me, I write from Italy and I apologize for my bad English, I recently found a Midget Movie, does anyone have any information about it? Is it just a small projector or is it also a manual camera? It looks very much like a hand turned Pathe-Baby camera, model C.201, but missing its lens. They were made in France between 1923 and 1930. Welcome to the forum, Carlo ! Do you have other 9.5 equipement or films ? It's always nice to see ninefivers from all around the world. 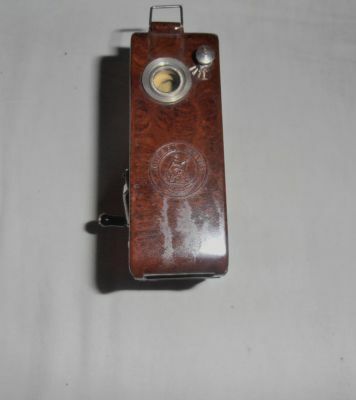 no it is not a Pathè, meanwhile in the Grahame N 'Web Pages 9.5MM EQUIPMENT CATALOGUE, I found this camera / projector, Mr. Grahame owns one and kindly described it to me as a puzle ..., we will try to solve it .. .
A camera/projector made by Midget Movie Ltd, Garford Street. London E14 which probably comes from around 1932. Measurements: overall: 110 mm x 55 mm x 116 mm,Description: The Midget Movie Camera and Projector. Plastic body movie camera and projector for 9.5mm. Fitted with a simple lens with rotating plate with four apertures. Oscillating shutter, claw drive, concentric feed and takeup reels.. Built in 6v lamp for projection. Hand turned. Simple wire frame finder. Darkroom loaded. Midget Movie Ltd. The very earliest cinematographers used dual camera/projectors like Lumiere's CINEMATOGRAPHE, and there was the BIOKAM, and the BIRTAC of Bert Acres. Later, for 9.5mm, was the SCREENUS, the MIDAS, and the CAMPRO. The latter accepted the standard Pathe chargers. interesting, the last three I have them all, actually I have four, because there are two versions of Campro, Campro and Campro MK1. It is interesting to note how this type of machines that are commonly called camjectors, developed in a short period from 1930 to 1933 and only in England in London. Interesting, I had never seen it before. I knew the other camera/projctor models, not this. Luigi, no unfortunately it doesn'work, the internal chassis in zamak is broken, I'll try to fix it.